LEAVES LIVING ART, BUT PAGE, TO SERVE HIS WITT. AETATIS 53 DIE 23 AP. Shakespeare is shown bareheaded, dressed in a doublet, collar and cuffs. Over the doublet he wears a gown. In front of him is a cushion with gilt tassels on which he rests his hands. In his right hand he holds a quill pen which is a real quill that has to be replaced from time to time; in his left hand he has a blank sheet of paper. 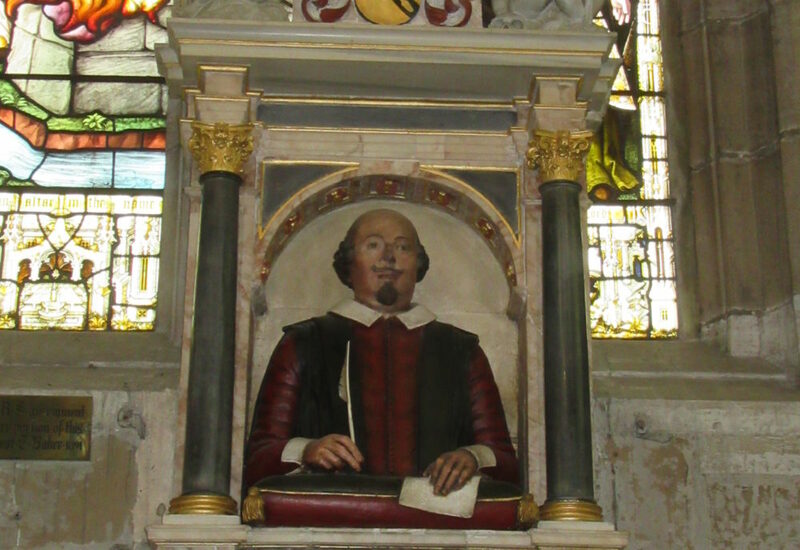 The monument is of the ‘preacher’ or ‘scholar’ type with a truncated effigy and ornamental surround. Late medieval in origin, it became popular in Oxford around the turn of the sixteenth and seventeenth centuries and then spread elsewhere. Shakespeare was neither a preacher nor a scholar. Ben Jonson chided him for having ‘small Latine and lesse Greeke’ – the one an essential and the other a desirable qualification for the role at the time – and he was probably not entitled to wear the gown in which he is portrayed. He sports it as a mark of social status, to which his coat of arms also makes claim. The sculpture has all the hallmarks of the ‘Southwark School’ of foreign craftsmen who settled south of the river Thames during the sixteenth century to avoid a ban on immigrant labour which was imposed by the City of London livery companies. They developed a distinctive style which was adapted from work in the Netherlands from which they came, using a colourful combination of materials, particularly alabaster and black marble, enhanced with a great deal of paint and gilding and a bastardised style of classical architecture for the surrounds. The herald and antiquary Sir William Dugdale noted in his diary for 1653 that this memorial and that of John Combe nearby were the work of ‘one Gerard Johnson’. Dugdale is not an entirely reliable source in such matters but his testimony must bear some weight and it points to Gerard Johnson the Younger, a second-generation member of one of the leading Southwark workshops. 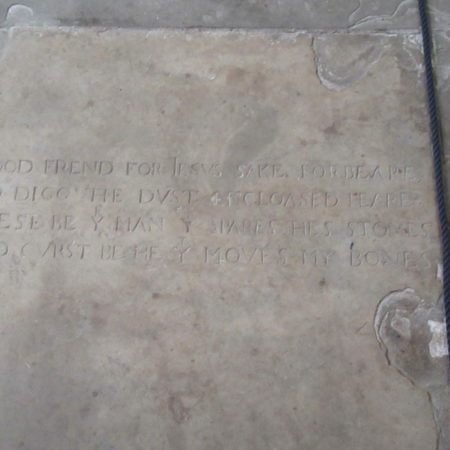 The inscription does not cohere with the monument itself. 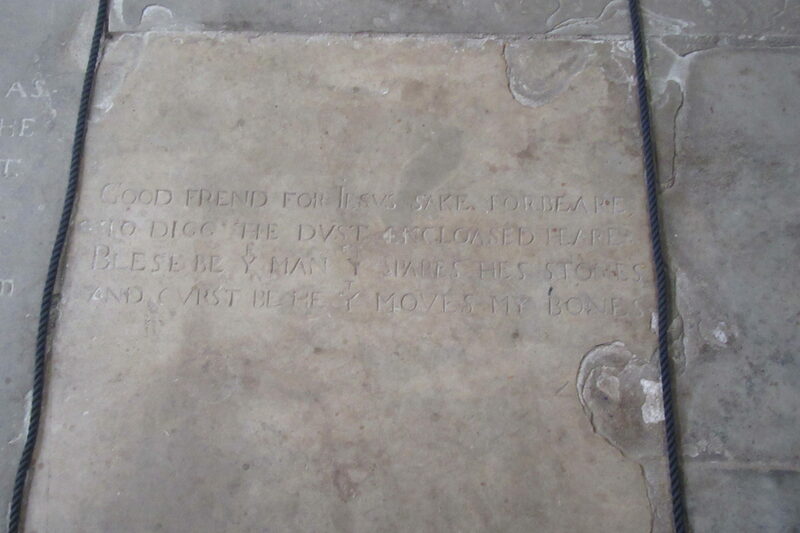 It is a scrappy assemblage of words, crudely cut, the lettering being far below the standard of most Southwark work. Remarkable by its absence is any of the genealogy and biography in which Elizabethans and Jacobeans delighted. All we have by way of personal detail is Shakespeare’s date of death and his age which are inserted at the bottom in smaller lettering. 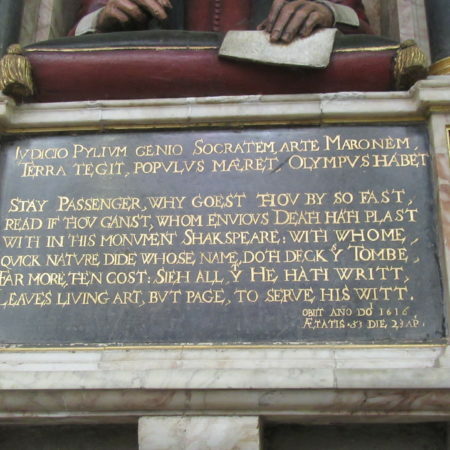 The rest is an epitaph, in two lines of Latin and six of English, of the type which several poets contributed to the First Folio of his works, published in 1623. 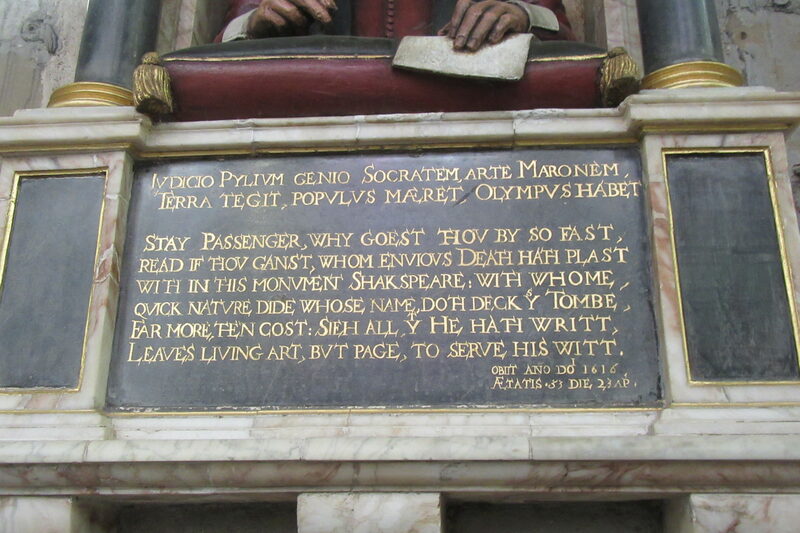 One of the poets in question was Jonson and the epitaph has been attributed to him. It rehearses a familiar theme of the period, derived from Horace, that a person’s life and work are his true monument ; the theme recurs, in much more lucid form, in his First Folio epitaph. The whole text shows every sign of having been added after the monument was erected. This strongly suggests that Shakespeare set up the monument to himself, following a common and well accepted practice of the time, leaving others to glorify him in verse and to specify when he died. If so, the effigy acquires a new interest and significance. In the twentieth century it did not get a good press. The famous Shakespearian scholar John Dover Wilson said it made the Bard look like a ‘self-satisfied pork butcher’. It has been repainted more than once and if the later paint layers were removed some detail might be revealed which would improve the likeness.